Autoethnography: The approach to research and writing that seeks to describe and systematically analyse (graphy) personal experience (auto) in order to understand cultural (ethno) (Ellis, 2011). We have all become quite familiar with the term autoethnography, but now its time to break it down and understand the methodology to the experience. There are multiple authors that take different approaches to the process of creating an autoethnography. For example; Ellis (2011), discusses that his methodology is based on experiences, epiphanies and sharing the analysed lived experiences that one undergoes. Denzen (2003), on the other hand, takes a more political approach to autoethnographies recognising that there is ‘elements of freedom, critical imagination and reflexivity’. Anderson (2006), an analytical autoethnographer states that to write successful autoethnographies you must ‘engage in reflexive social analysis and self-analysis and that it requires the researcher to be visible, active and reflexively engaged in the experience’. Each author’s methods are different and are in no way wrong. It depends on how you want to approach creating your autoethnography. If you want to critically analyse your situation then Anderson’s methodology would be for you, but if you want to take a more creative approach to your experience then Ellis’ methodology is useful. Politically analysing situations and understanding why things are shaped the way they are in a culture means that Denzen’s approach to autoethnographies would be appropriate. Since I recently broke my arm and had to have a few weeks off from classes, I am now completing a two-part autoethnography instead of one group and one individual assignment. I will be exploring the world of Webtoons more in-depth than originally planned and breaking down the structure through Ellis’ methodology concept and looking into further research through Denzen and Anderson’s methodologies (still yet to be decided as to which research avenue I will be taking). To understand Webtoons, I will be creating a two-part podcast series. The first podcast will delve deep into the unknown world of Webtoons. 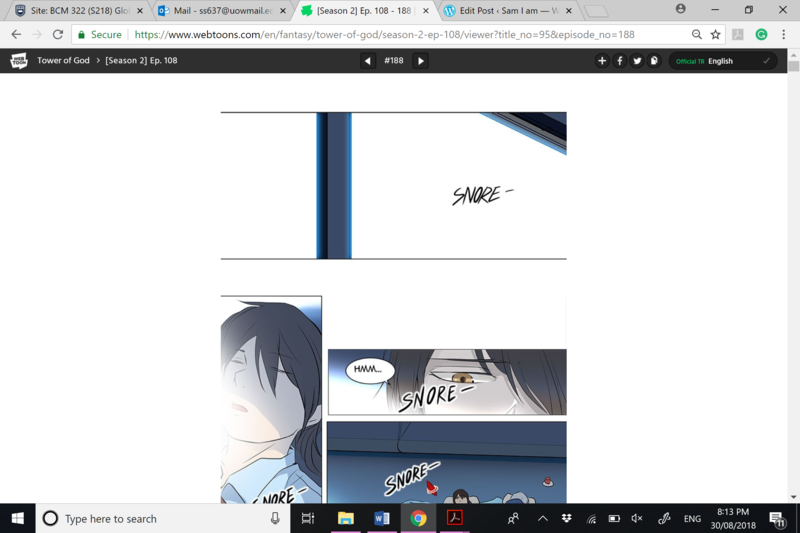 I will break down Webtoons bit by bit so those who are new to Webtoons can fully immerse themselves without becoming overwhelmed with the amount of content that is available. The first podcast will give you all the tips and tricks to navigate through the Webtoons rabbit hole that I was once lost in. The second podcast will explore a more in-depth concept of Webtoons and how the content in the industry has become what it is today – this will take a more political and analytical approach to understand Webtoons. Topics that are of interest already involve; South Korean culture and laws, censorship, the sexuality and representation of women in webtoons and growing trends of webtoons and crowdsourcing translation. Research shows that women in South Korean are meant to be submissive and to maintain harmony (K4E Editor, 2015), but throughout reading different episodes of Webtoons, women are often represented as the ones with power and are seen as the heroes. Song (2016), says that media across the world is “frozen in a time-warp of obsolete and damaging representations” (p. 9). Women have also been heavily sexualised in some Webtoon series and while it is not accepted in South Korea on a national level, especially among K-Pop bands, sexualisation is accepted on an international level. This means that the Webtoons that I view here, in Australia, in my bedroom, on my laptop, may not be the same as those who live in South Korea. There are also growing trends in the popularity of Webtoon series across the world, not just in South Korea. I briefly touched on this in my last post and will be discussing this topic further with Brian Yecies, a University of Wollongong lecturer. In my discussion, I hope will uncover more on the growing trends of Webtoons across the world and the concept of crowdsourcing translation. Anderson, L 2006, Analytical Autoethnography, Journal of Contemporary Ethnography, vol. 35, pp. 373 – 392. Denzen, N.K 2003, Performing [Auto] Ethnography Politically, The Review of Education, Pedagogy, and Cultural Studies, vol. 25, pp. 257–278. Ellis, C Adams, T.E Bochner, A.P, 2011, Autoethnography: an Overview, Forum: Qualitative Social Reseach, vol. 12, no. 1, pp. 1-12. K4E Editor, 2015, Traditional Role for Women, Korean 4 Expats, last viewed 4 October 2018, <https://www.korea4expats.com/article-traditional-role-of-women-korea.html>. Song, B 2016, Seeing is Believing: Content Analysis of Sexual Content in Korean Music Videos, Southern Utah University, pp. 1-60. Sitting in my Global Media Interventions class, Monday morning of week 6 and our lecture is on Webtoons, transformation into the global space and the new era of platformisation. 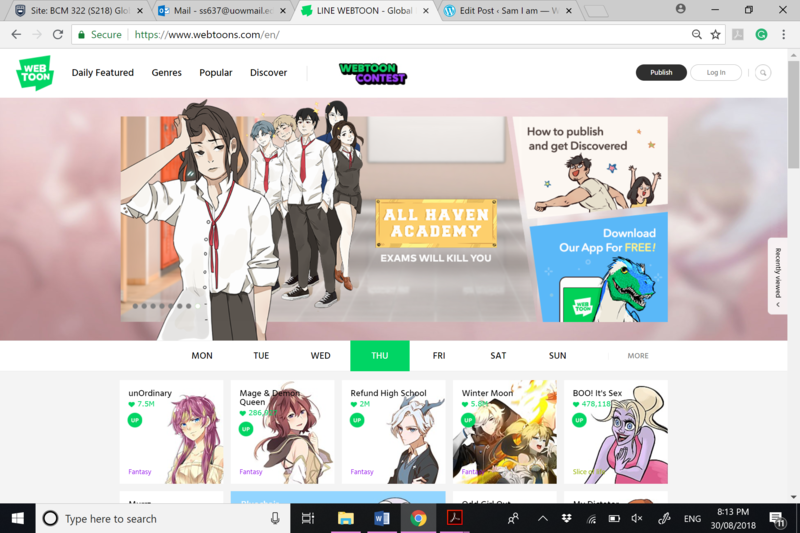 Webtoons history was introduced and I learnt that they were created in South Korea in the 2000’s where comics became digital and online (Yecies, B 2018). It’s the practice of using a mobile scrolling device with the flow of imagery to make a story. The lecturer Brian Yecies (2018), has completed studies on the popularity of Webtoons across countries. Statistics show that Webtoons has a large fan base in Japan and China and it is increasingly growing in Indonesia, Malaysia and even in the United States (Yecies, B 2018). In my own research time, I googled “Webtoons” and I clicked on the first link. It was in another language and before clicking translate, I had a quick look around to see what I could discover without the English language at the forefront. I didn’t get very far until I was rummaging around in a rabbit hole with like Alice in Wonderland. I translated the page and found that what I was looking at was a gold mine for comic lovers – so many genres, types, and artists! With multiple genres in the Webtoons comic series, it made choosing a comic series hard. There are so many different types of comics within each genre all with a large number of likes and views making my decision difficult. Normally, I am a sucker for romance, action and drama but considering autoethnographies are about experiencing “new and abundant opportunities” (Ellis, C et al. 2011) exploring a new genre was on the cards. I decided to have a quick browse through the Fantasy genre to see what I could find. With my brief research and viewing of Webtoons and the Fantasy genre, I can see that translation is not always correct which highlights the significance of the imagery used. This was a major epiphany as translations and meaning of words may have a different significance in different cultures and you can often get lost in translation without the images. Thus, making sure that I fully immerse myself into the Webtoons culture to have a better understanding of the comics that are produced. I will have to make sure that I read the text bubbles as well as taking in the imagery of the comics as images are a crucial part of Webtoons and comics. Translation can be defined as “a message that is transferred from one language to another and the tropes of border and bridge work powerfully” (Gambier, Y 2016). Translators for Webtoons, do not need a degree in translation nor do they get paid for their efforts. They are all volunteer which is a crowdsourcing initiative to create a more socially inclusive platform for all. This initial experience of exploring the Webtoons online community has gotten me excited to explore Webtoons and for further research that I will be conducting throughout the process of this autoethnography. Gambier, Y 2016, Rapid and Radical Changes in Translation and Translation Studies, International Journal of Communication, vol. 10, pp. 887 – 906. Jenkins, H 2008, Convergent Culture: Where Old and New Media Collide, New York University Press, Chapter 3: Searching for the Origami Unicorn: The Matrix and Transmedia Storytelling, pp. 93 – 130. Johnston, R 2016, 42% of LINE Webtoon Comics Creators are female and half are read by women, Bleeding Cool, last viewed 28 August 2018, <https://www.bleedingcool.com/2016/02/29/42-of-line-webtoons-comic-creators-are-female-and-half-are-read-by-women/>. 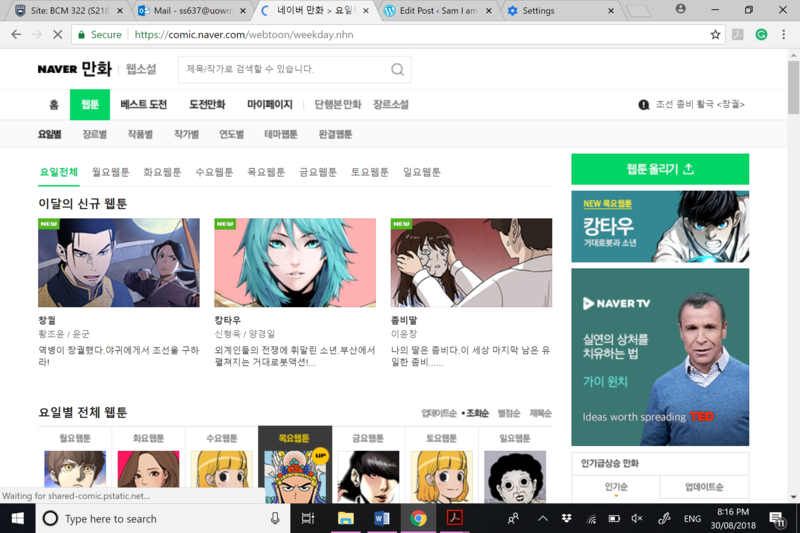 Shin, M 2013, How Webtoons are Democratizing the Korean Contents Industry, Atelier, last viewed 28 August 2018, <https://atelier.bnpparibas/en/prospective/article/webtoons-democratizing-korean-contents-industry>. Sui, 2014, Tower of God: Season 2, Ep. 108, Webtoons, last viewed 28 August 2018, <https://www.webtoons.com/en/fantasy/tower-of-god/season-2-ep-108/viewer?title_no=95&episode_no=188>. Wass, J 2009, Manga Guide to Statistics: Statistics with heart-pounding excitement (well maybe), R&D Mag, last viewed 28 August 2018, <https://www.rdmag.com/article/2009/05/manga-guide-statistics-statistics-heart-pounding-excitement-well-maybe>. Yecies, B 2018, Transcreation Intermediaries in South Korea’s Digital Webtoon Platform Ecosystem, BCM322 Global Media Interventions, University of Wollongong.